Another Record Store Day event arrived today with the 2017 Black Friday promotion starting this morning, and copies of U2’s “The Blackout“ being available in two vinyl formats at a variety of locations. The record was a 12-inch vinyl which features the album version of “The Blackout” on one side, and “The Blackout (Jacknife Lee Remix)” on the other. It is the fourth time U2 participated in the Black Friday event, having released “Wide Awake in Europe” in 2010, “Ordinary Love” in 2013, and a special map of “North and South of the River” in 2014. This year marks the first time that U2 actually took part in the main Record Store Day in April (”Red Hill Mining Town“) and the second Black Friday event. The vinyl is packaged in a generic white sleeve, and then inside of a generic black sleeve. The only text visible is the black label. The label on both versions is the same, with a catalog number of TMR – 522, although the limited colour release was referred to as TMR – 522X in marketing materials. We are told that 20,000 copies were printed in total of this release, with only 750 of those being the limited coloured vinyl. This has created a strong demand for the “eclipse” version, and a much lower demand for the all black version. There was a high number of copies distributed in Europe this time out of the black-only version as well. The limited black and white version of 750 copies was distributed at Freebird Records in Dublin (we’re told close to 100 copies), at Rough Trade East in London (150 copies), and at both Third Man Record storefronts, one in Detroit and one in Nashville. We’ve gone back to when the release was first announced, and tracked the eBay activity on this item, right up until this afternoon. We tracked only actual sold items, and are not looking at listings that are still underway, or that ended without a sale. The release was first announced October 26, 2017. Within a few days the earliest listings appeared on eBay. And not knowing how limited this release would turn out to be, copies also sold quickly. The first copy sold on October 30th in the listings we are able to see. And for the first few weeks, the vinyl was coming in close to $100USD when sold. 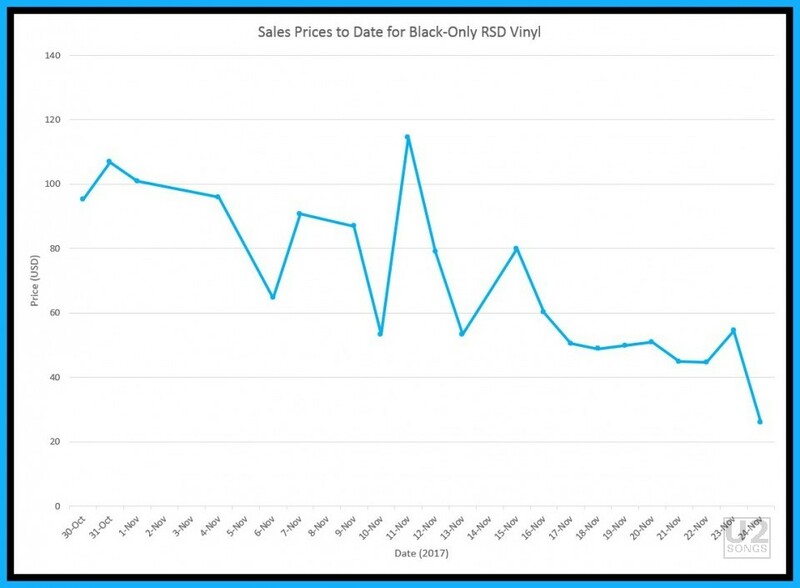 Prior to the start of Record Store Day, the most expensive copy sold for $178.50, and the least expensive copy sold for $40.88 — with the lowest being on the day before copies were made available to the public. We often get asked, how do people sell these limited edition vinyl before they hit the streets for sale? It’s speculative selling. The seller expects to be able to access the vinyl, so they put up a sale for the item, even though they do not yet have it. 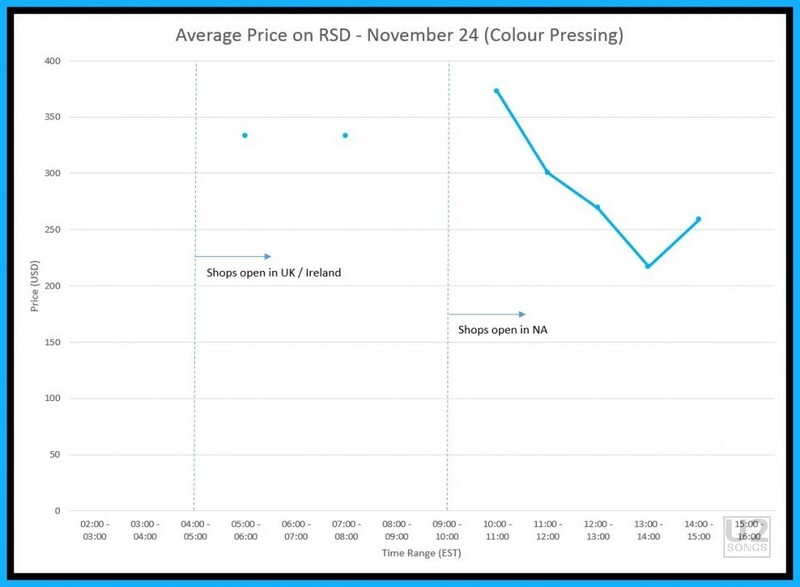 As you can see from the graph above, these prices usually start high when first listed, and people want to ensure they get a copy, and usually come down in price closer to the time of the sale. You will also see a huge drop off in price once the main vinyl is released. The average price this item sold for on eBay today is $25.95USD, a huge drop off from the average $100USD it was fetching when it first appeared online. A little closer look at the prices throughout the day today of the all-black version of the vinyl shows that the prices actually came down throughout the day as well. The points in the graph are an average of all the standard versions of the vinyl sold for that hour. Time is Eastern Time. We’ve dotted in a line for where the majority of shops open in the UK and Europe, and again when the majority of shops on the Eastern coast in North America would be opening. 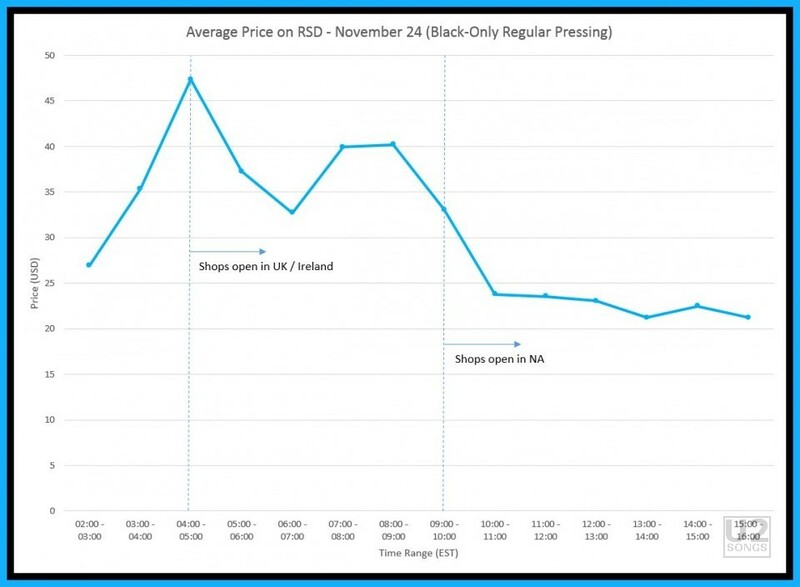 It shows a spike in prices up to $47.32 on average as the shops were opening in Europe. This is when many of these vinyl are first put on eBay and sellers and buyers are not sure at what prices these will eventually settle. Throughout the day, the prices decline as the inventory on eBay go up and buyers are presented with a wider selection to choose from. Once shops open in North America and a further amount, and by far the largest amount hit eBay, the price reduces again, and by 4pm ET, the vinyl had settled out on average for $21.21 on eBay, but be warned, these prices are without shipping, so the total you may pay is higher should you go that route. We expect that the price for this item will stay around $20USD in the future. With such a large quantity there are likely to be many copies for sale for years to come. The “Red Hill Mining Town“ vinyl which was limited to 7000 copies is still quite plentiful and not that difficult to find, and there are more than twice as many copies of “The Blackout” that have been pressed, although with the inclusion of a new song that will not be on North American and European copies of the album, there may be slightly higher interest in this release. But what happened with the limited edition coloured vinyl copy that was pressed in a small quantity of only 750 copies? Unlike the black only vinyl copy the limited edition black and white version did not get sold on eBay prior to its release today. Only one copy was available by auction prior to today’s onsale that we were able to identify. That auction closed after the vinyl went on sale today (it’s still running), giving the seller an opportunity to cancel the auction if they could not get a copy. The first copy of the limited pressing actually sold, was sold from the UK, for a total of 250 GBP or approximately $333.54USD. The sale took place at 10:20am local time, just twenty minutes after Rough Trade East opened this morning, the retailer of the vinyl in London. With far less copies pressed and available, we only counted 15 copies that had been placed on eBay and sold, by 4pm ET. We graphed the average price for these items in the graph above. The first three listed went for the highest prices of the day, being the first to appear on eBay as collectors waited patiently for a copy to appear. The first two both went for $333USD, but the third one on eBay actually sold for $665USD, making it the copy that fetched the highest amount throughout the day. Prices from that point onward started to drop as more became available. Toward the end of our look at pricing they had settled in around $250USD. We will have a few additional looks through the week to see if this price drops further. The whole speculation market in these types of releases makes many fans (us included!) upset. Fans were out early today to buy copies of the album, in the hopes they would get one. Luckily with the black vinyl fans are reporting finding the copies they want, and highly stocked stores. My own store in Canada which only received five copies of “Red Hill Mining Town” received 25 copies of “The Blackout” on black vinyl today. Lucky for the fans this time around, the limited nature of the coloured vinyl was tempered with good quantities of the all black vinyl. And its been fun to watch fans who have lived in London, Dublin, Nashville, Detroit, or areas nearby getting in line early and doing what they can to get a copy of the limited edition of the vinyl. Kudos to those fans who have gotten copies of this into hands of other fans for a fair and reasonable price today. You are our favorite kind of people.